Google is the search engine used for 75% of all internet searches from desktop computers. For mobile searches, Google is used 90% of the time. “Google” has become a verb (“Let me google that for you!”) because it is so widely used. When talking about how to make your website stand out in a website search, we focus on Google, although Bing and Yahoo are also important and should be considered. The Yoast Meta Box in WordPress is a helpful tool in the process of highlighting your important website content in search results. At Design TLC, we use Yoast SEO to help our website posts and pages show up and stand out in searches. This plugin is a tool that helps set up basic technical SEO configurations for WordPress, like sitemaps and page indexing. In addition, it analyzes the content within your posts and pages, when using the tool, to advise you about the length and quality of the content, the use of your focus keyword, as well as the “snippet” information that will show up when your site is listed in a search. Compared to the Starbucks example above, you can see that Jitters Cafe is not making the most of the opportunity to drive traffic to their website and grow their business. The two titles may be the same, but do not have to be. Yoast has a lot of great documentation on best practices for SEO, including How to Create Strong Titles. Keep in mind that the length of the Title show in the snippet will vary depending on the size of the device it is being viewed on. The title should be long enough to be descriptive, but not too long so that it is cut off before the important “key” words are visible. The Slug for your website page or post is the “title” of the page in the url (what usually comes after the last “/” in the url). With Yoast, you can customize the slug easily, and it is a good idea to include the keyword you are trying to rank for in the slug if possible. 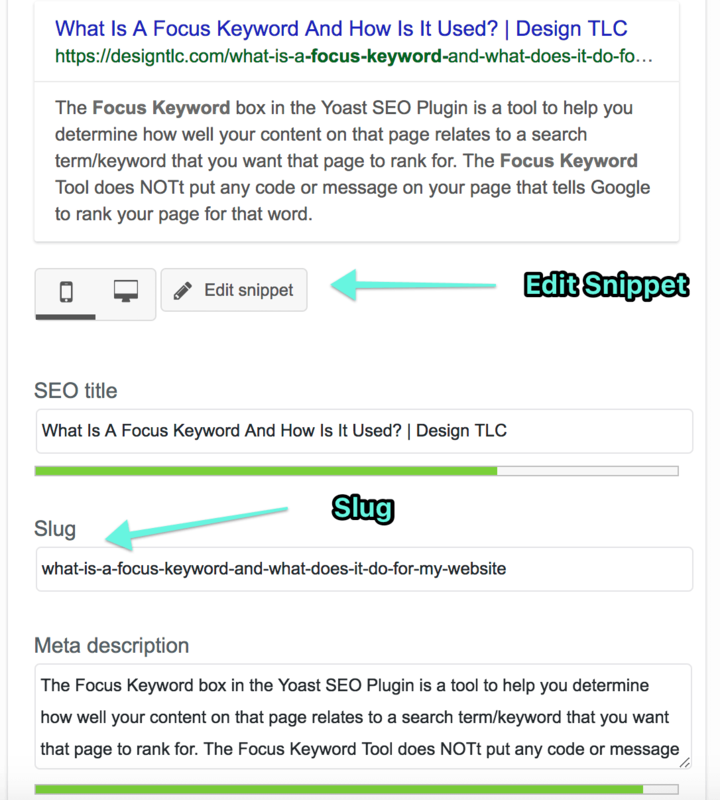 To edit the Slug, SEO Title or Meta Description within the Yoast plugin, simply click the “Edit Snippet” button within the Yoast Editor at the bottom of your page or post. The meta description is the small amount of text that often appears in the snippet. Surprise! What you write here does NOT affect your ranking in search results. AND what you write may not always be what Google shows here! Sometimes, Google may find text within your webpage that fits better to a search term, and will pull that text instead. Nonetheless, meta descriptions should be carefully written to inspire users to click on your link to read more. The Meta Description for Jitters Cafe above does not make use of the opportunity meta descriptions offer. Ideally, this text should include a call to action, such as “Learn More,” “Buy Now,” or “Free Trial.” The length of this description for Google has recently been increased from to 160 to 320 characters. With the increased use of voice search, well-written meta descriptions are becoming more critical to help users select a link that solves their problem or answers their question. Yoast is a very helpful tool in setting up and making the most of opportunities to influence the appearance of your website links in Google (and other) searches.